Catchy song, a fancy performance and adorable kids – IKEA has a recipe for a viral video on its hands for its latest online platform launch. The result: over 850,000 views and 4,200 engagements have been generated within one week on IKEA Hong Kong Facebook page and YouTube channel with paid boost. Plans are to spread the video to other online channels and distrubute it outdoors. 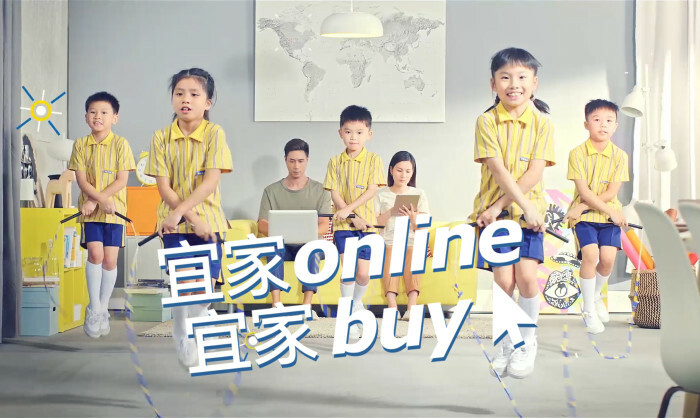 The 30-second video, launched last Monday, adapts a well-known local kid song “何家公鷄何家猜” while replacing its lyrics with the new online sales services benefits and adds a call to action. The song is sung by kids from Hong Kong Rope Skipping Academy also perform enthusiastically as they sing the song in the video. “We understood that it’s getting harder and harder to grab people’s awareness from online nowadays that with tons of things they can choose,” said Andrew Lee, Metta Communications’ representative, the creative agency of the video. IKEA HK’s country marketing manager, Janet Lai, said the brand would now be able to enhance its present customer shopping journey with even more convenient service online. “Customers can now shop anytime anywhere for our good quality yet low price products, complimented with the inspiring home furnishing solutions that we have on offer,” she said. Competition among instant banking is getting fiercer than ever while DBS takes one step further to introduce DBS IDEAL RAPID, an a..